Function: 1600 lumens CREE XM-L T6 U2 L2 LED Spotlight Flashlight. 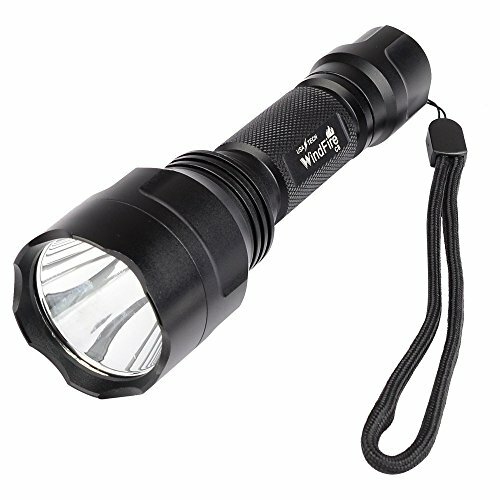 - Provide super bright light beam, brightness can be up to 1600 lumens. - Type: CREE XM-L T6 U2. Material: high quality 6061T aluminum alloy. Power Source: 1 x 18650 3.6v / 3.7v rechargeable battery(not included) . - Length: 146mm or 168mm. Note: The flashlight itself is not with rechargeable function. 1 x WindFire C8 High Power 1600 Lumens Spotlight CREE XM-L T6 LED Flashlight. WindFire C8 1600 Lumens Spotlight Lamp CREE XM-L T6 LED Bulb Spot Lamp Flashlight.